Celebrating and preparing Izzy's birthday parties is always great fun. This year I wondered how I would pull it off but I knew I had to, someway, somehow. I figured I could manage since the party fell on one of the better weeks in my treatment schedule. Izzy requested a "Franny K. Stein" mad science party. I know he was conjuring up explosions in the living room and I knew I wouldn't have the wherewithal to create them. Instead of doing everything myself, I hired a "mad scientist" to help out. I also enlisted the help of friends and family and all I had left to do was bake the cake (with test tubes - which Izzy declared he needed two days before the party), cupcakes and pop up the popcorn. All important to my party plan was keeping the party no longer than two hours (something all parents should consider). Easier said than done. It was more work than I anticipated but it all came together in the end and I was able to sit through it for the most part. The party was supposed to begin with snacks but Izzy and friends were so over-excited they had to be herded into the backyard where mayhem ensued. 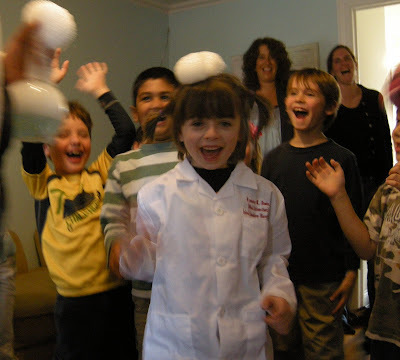 When the mad scientist arrived (which wasn't soon enough) the children settled into rapt attention. From bubbles to explosions it was just what Izzy had in mind. Experiments over, next on the agenda was cake and dessert. My friend L. assembled a most professional-looking fruit arrangement, with beautiful organic fruit. Too bad Izzy and his pals thought to use the skewers as weapons. As for the cake it was similar to the one I made last year, Chocolate Layer Cake with Raspberry Filling and Chocolate Frosting. 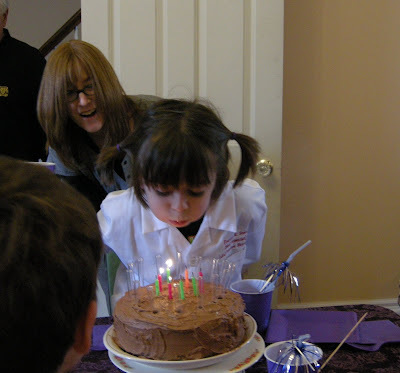 This one was a more classic layer cake, adorned with test tubes which my dad found for me at a medical supply store. Perfect! Much giddiness ensued and then it was time to sing "Happy Birthday". So glad it turned out to be just the party Izzy had wished for. So glad that I could be there. So very glad you could be there! We have missed you!Warm wishes from the north. Sounds like it was a great birthday party. Glad you were able to make it a success. I am thinking of you! Looks wonderful. I send you good thoughts every day. I'm glad this was so magical for your son & you! aww....I love it! (especially the cake....heh...) It looks like such fun!! Happy Birthday, Izzy! Glad to be back posting. Don't know if I will be able to keep up the pace after my treatment tomorrow but will give it a try! Thanks for all of your kind thoughts.